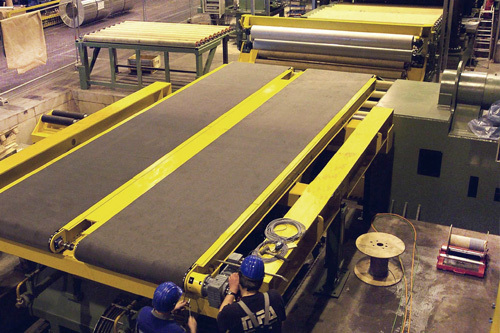 We provide you with a wide spectrum of materials-handling technology. 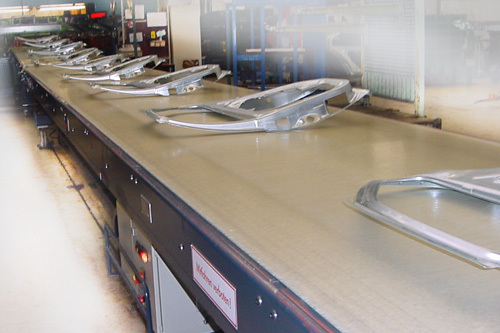 When it comes to belt conveyors, we deliver individual belt conveyors with height and width adjustment options up to the complete part conveyor belt lines. 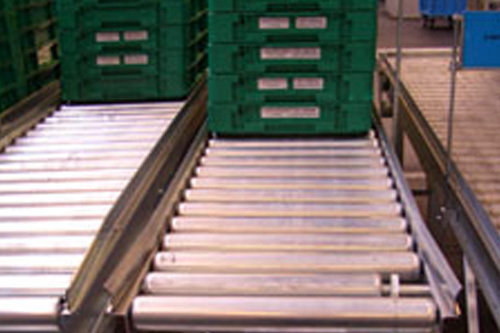 If you require the use of roller conveyors, we can provide you with the right selection. 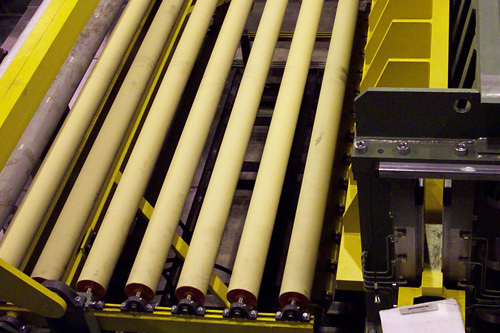 We produce both powered and non-powered roller conveyors for easy to difficult applications. 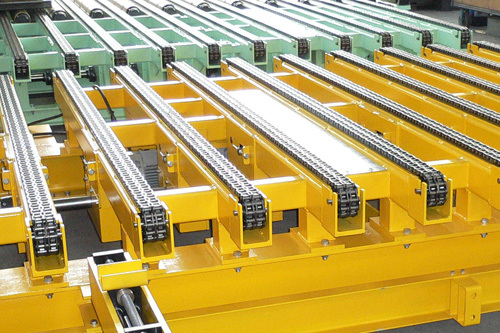 For the manufacturers of intersecting lines, we offer an ideal connection of your unit components with the proper materials-handling technology. We guarantee you an exact integration with your line, all the while taking the possibly existing, disturbing contours or intersections into consideration. 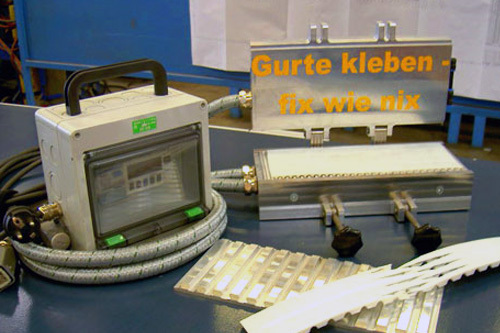 Für den Abtransport von Blechen hinter einer Pressenlinie oder Fertigungszellen, decken diese 1-Spur-Gurtbandförderer ein breites Anwendungsspektrum ab. Hierbei können diese Gurtbandförderer zusätzlich mit Rädern zum Verschieben bzw. Höhenverstellen zum Einstellen der optimalen Arbeitshöhe ausgerüstet werden. Für viele Ihrer Anwendungsfälle haben wir bereits eine konstruktive Ausführung in der Schublade. Geben Sie uns hierzu Ihre Anforderungsbeschreibung. For the removal of sheets with complicated or vaulted forms and thin sheet thickness, we recommend the use of our multi-lane belt conveyor. 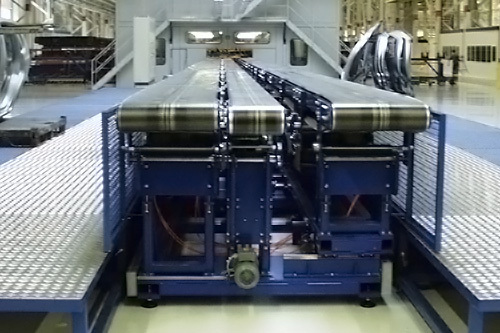 These usually consist of 3 individual belts, the height and width of which can be adjusted. With that, the part form belts can be adjusted and thus, prevent, for example, that the parts vibrate around. If a position-exact part feeding is required, servo-motors are used. 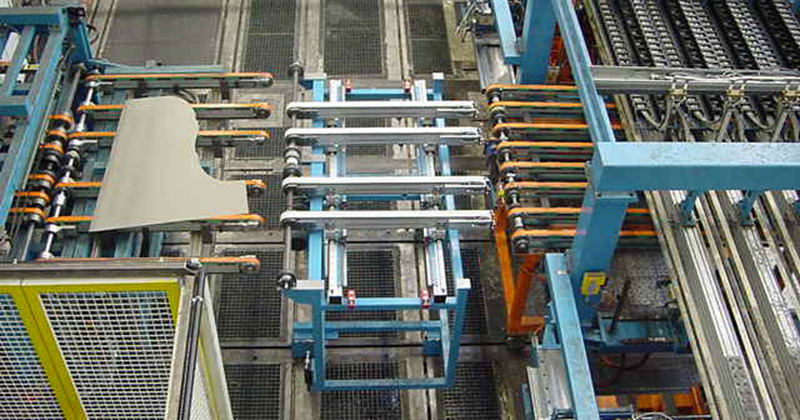 Another case of application for our conveyor belts are board feeders or intersecting lines. 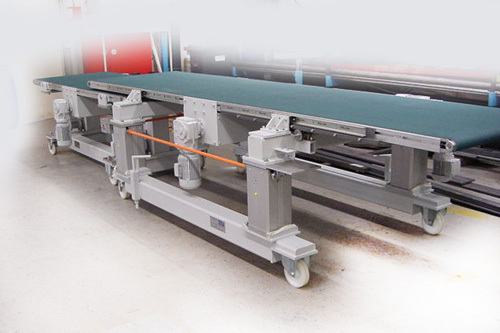 For this, we deliver width and length interchangeable drive belt conveyors. For transporting magnetic sheets, permanent or shifting magnets are integrated into the basic profile. We look forward to hearing about your special situation! 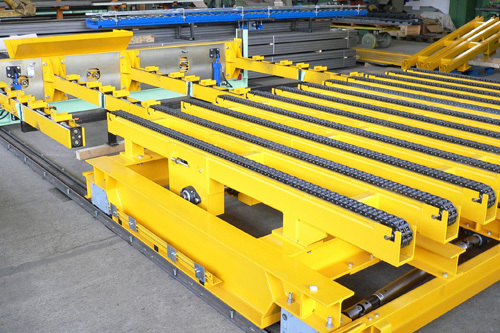 Our chain conveyors are put to use for the transport of heavy containers or board transport pallets or together with lifting measures for assemblies. Either simple, duplex or triplex chains are used for the transport, depending on the required carrying weight. A load is removed on a steel V-ledge for good movement characteristics. 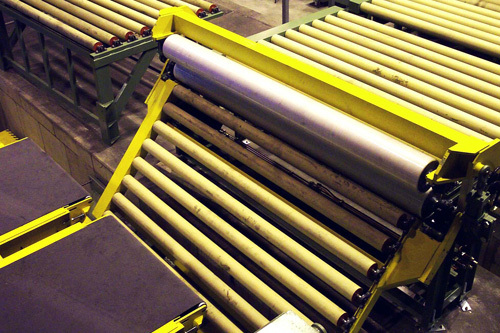 For the disposition of materials or containers, our non-powered roller conveyors fulfill a useful task daily. By using carrying rollers with special movement characteristics, the moving of heavy bins, cargo or goods can become an easy task. 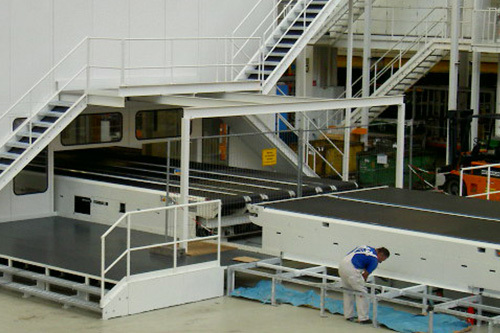 The path of transport can often be shortened or saved altogether in a simple way by using the inclined roller conveyor. We'll realize your complete transporting tasks for various cargo pieces, pallets and containers. Whether it's the transport of board stacks or white goods (appliances), every application is a new challenge for us. You can profit from our many comprehensive years of experience. 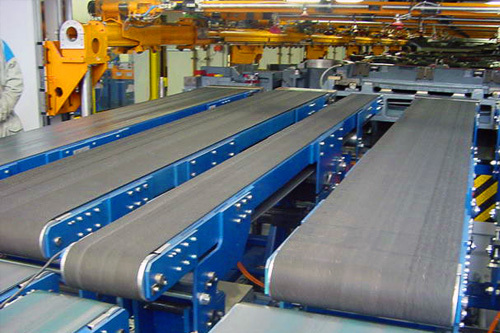 Changing a belt has always been a timely process and often leads to long machine downtimes because normally a number of drive belt conveyor components must be disassembled in order to detach the seemingly endless drive belt. This work step is no longer necessary because the belt is first closed together after all arrangements have been completed.